Favorite dish: I don’t have just one favorite, but certain food items always put a smile on my face. One of them is grilled octopus. That lightly charred, meaty texture takes me on a little Mediterranean vacation. Favorite dessert: For me, a great dessert is neither too sweet nor too rich. My absolute favorite is mixed red berries with cold champagne sabayon. Favorite kitchen tool: A chef’s knife. Favorite food city: New York city, because it’s easily accessible from Aruba, and because when it comes to cuisine you can find the entire world there. I’m also very curious to visit Israel and Japan. Favorite vacation place: As a chef and restaurant owner, I don’t have that much spare time, but when I do go on vacation, I look for places that offer exciting flavor, fresh local ingredients and off-the-beaten-track food combinations. A chef who most inspires you: I am fascinated by chefs like Tomas Keller and Daniel Humm, and I am inspired by Bobby Flay’s culinary style. But, at the end of the day, my own palate is my main culinary compass. 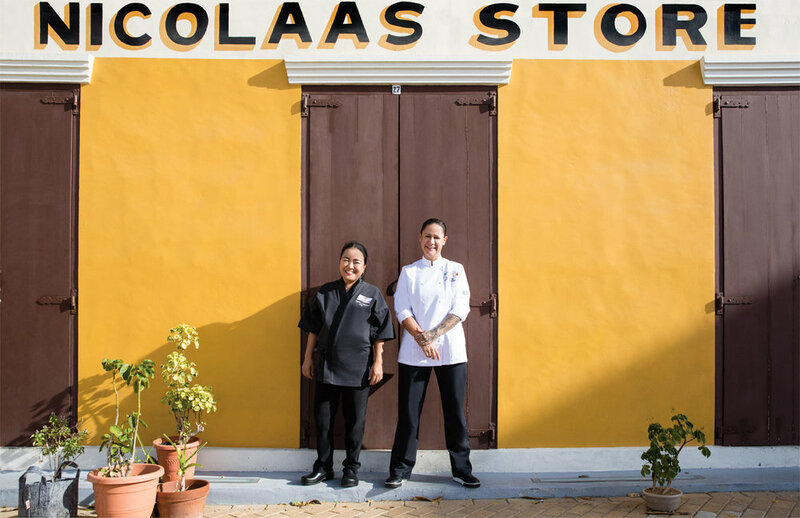 After coming to Aruba with a master’s degree in fashion design in 1995, Chef Mylene Leona Lapinid traded in her scissors for kitchen knives. At Omakase Restaurant, she puts her creativity, eye for detail and more than 20 years of experience into crafting exquisite Japanese dining experiences. As the sushi chef, she’s branched out from basic maki to incorporating ingredients like banana and crunchy tempura into a wide selection of cooked rolls, all while paying homage to the traditional art of sushi-making that she has learned from sushi masters. Consider yourself in good hands when you pull up a seat at the 10-seat bar inside The Chophouse Restaurant, where Chef Lapinid directs the fashion runway-worth presentation of carefully shaped maguro nigiri, rainbow rolls and yellowtail handrolls. After all, Omakase means “leave it to the chef." Favorite dish: Litson. It’s a whole roasted pig. Favorite dessert: Halo-halo. It’s sweetened mixed fruit and milk served with crushed ice. Favorite kitchen tool: The sashimi knife that I’ve been using for over 20 years. Favorite vacation place: Anywhere in Asia. A chef who most inspires you: Masaharu Morimoto.